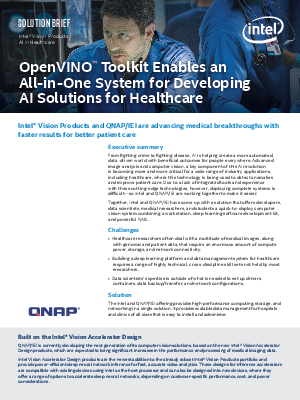 Advanced image analysis and computer vision are key components of today’s AI revolution and is becoming critical for a wide range of industry applications, including healthcare, where this technology is being used to detect anomalies and improve patient care. Due to a lack of integrated tools and experience with these cutting-edge technologies, however, deploying complete systems is difficult. Applications that utilize deep learning approaches often require large amounts of highly parallel compute power, storage, and networking capabilities, along with performance optimizations for faster data analysis. The Intel and QNAP/IEI solution combines all these elements in one complete system for scalable data management for hospitals and clinics of all sizes. Read more on Intel’s and QNAP/IEI’s real-world use case on macular degeneration analysis through high-performance computing, vision capabilities, storage, and networking in a single solution.